Intex Mobile Projector Phone : Price in India | Free Pc to Phone Calls, Free Voip Calls to India International ! The technology is now advancing at a great pace. Its time for mobile projector phones, and yes India is no way behind. 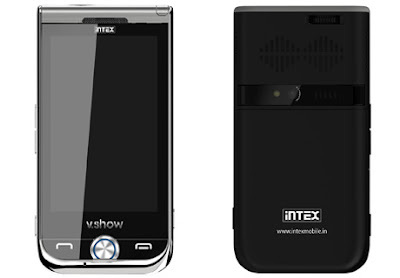 Intex has launched India's first projector mobile phone "V.Show". Intex Projector Phone not only provides projector but also video calling : Make Video Phone Calls with Intex projector mobile. Usually we don't blog about Mobile phones on this blog, but this is something new and we need to move with the technology. We today discuss what can you do with your mobile projector phones, apart from watching movies and videos. Lets discuss more about Intex Projector Mobile Phone's V.Show. 1. Projection upto 61 inches of screen/wall with a high intensity projection of 10 lumens and QWVGA resolution. 2. Projection can be enjoyed up to a distance of 12 ft (between the screen/wall and the phone). 3. Battery life of 3 hrs when watching the projection. So you can watch whole movie at once without charging. 4. Touch-screen Dual SIM (GSM + GSM). 5. Dual Screen mode (phone screen mode and projector screen mode are simultaneously active). 6. Dual Camera and a Dual Card memory slot of 8 GB each to expand the internal memory of 64 MB. 7. FM radio (wireless and wired) enabled, with GPRS connectivity and has an 3.2 inches dust resistant touch screen. This phone is available at around 12K in India, and with little bargain you can get this phone at Rs10000-10500. So, what can you do with this phone. Mobile Projector phone allows you to watch movie on the wall screen. Download the movie in your phone's (may be some companies start giving phones with pre loaded movies) : these movie are just 250 MB's, watch these movie at high resolution screen. Apart from that, what's now possible is that start a video conferencing call directly from your phone. With 3G already in your phone, you have option of making video calls using this high speed internet. Project this video on the wall, and start a video conferencing call. What's the best part is you can do all this for free. From free calls, its time for free video calls. You must have done video chat on your PC. Now it will be possible on your mobile Phone. I am waiting if Google start their Google Video chat for phone, with Google Voice already in the market. Yesterday, we blogged about Viber for PC, getting a technology backward from iphone to PC. Today we are talking about a technology moving from PC to Mobiles. The technology growth is quite evident! Please share your feedback if you have been using Intex Mobile Projector Phone : V.Show ! its nice intex mobile projector phone review,so many nice fatures. Wow..amazing phone. Really i like it, Thanks for sharing with me! Nice Phone This phone is a very uniq features and also looks likw a good. Thanks to share with us this new topic.